Those of us interested in the study of American religion in the Progressive Era and early twentieth century have had some fantastic reading material in the past year. I've previously covered two examples in new books from David Burns and Priscilla Pope-Levison. Now I get to turn to Matthew Bowman's The Urban Pulpit: New York City and the Fate of Liberal Evangelicalism (Oxford, 2014), a book derived from a dissertation completed under Michael Kazin at Georgetown. The subtitle seems to indicate that this book will be primarily about liberal evangelicals, and Bowman does indeed have much to say about that group. However, the fundamentalist antagonists loom large in the text as well. This may as well have been subtitled "the fate of evangelicalism." Bowman argues that the fracturing of evangelicalism in the late nineteenth and early twentieth century is best understood as a response to the crisis of the city. That sounds familiar enough on the surface. But Bowman's Orsi-inspired approach is unique. For him, evangelicalism should be seen as a religious style, a "set of behavioral expectations and methods of practice" rather than a "coherent theological proposition" (p. 10). Bowman zeroes in on three elements that united evangelicals in the nineteenth century: conversion (although there were competing notions about this process), a desire to interact with God through language, and an emphasis on the preached sermon and the read Bible as the means towards that end. American cities in the postbellum era, with New York as the primary example, shattered the confidence evangelicals had in the "connection between the city's cultural and physical landscapes and evangelical piety" (p. 13). The written and spoken word of God did not seem to be as powerful in a city teeming with immigrants and filled with mass media and new forms of entertainment. Thus, the assurance that evangelicals had in their dominance of New York City in the 1850s (Bowman is careful to note that this was a perceptual confidence, not necessarily a lived reality on the ground) began to fall apart in the 1870s and 1880s. The sense of crisis experienced by evangelicals was a reaction to their inability to effectively reach the city with the Word through the Bible and preached sermons. As evangelicals sought to preserve the faith, the divergent methods of liberal evangelicalism and fundamentalism emerged, both of which were the "product of pastoral experimentation" to find the most effective way of proclaiming the Word in the modern city of New York (p. 13). With that background in place, it becomes clear why Bowman's title, The Urban Pulpit, is so important. In his telling, it was in the response from the pulpit to the crisis of late-nineteenth- and early-twentieth-century urbanization that liberal and fundamentalist forms of evangelicalism developed. Bowman makes his case in eight chapters that stretch from the mid-nineteenth century through the 1920s. He is attentive (especially in the first two chapters, but also throughout) to the material aspects of lived religion in the city: physical space, soundscape, ritual actions, and so on. At the same time, he analyzes the thought of a number of leading New York evangelicals, both liberal and fundamentalist. This is not a study in which the city of New York is merely the geographic selection criteria used by Bowman in order to decide which theologians he should analyze. Rather, the sights and sounds and spaces of the city shape the spiritual sensibilities of Bowman's protagonists. As the book progresses, Bowman moves chronologically through what he sees as key developments in the emergence of a liberal evangelicalism (and its ever-present fundamentalist counterpart). He argues that the proto-liberal evangelicals began to diverge from the evangelical consensus in the late nineteenth century by imagining and enacting new ways in which the Word could be spread in the city. More than a verbal proclamation, they began to see that the Word could be embodied and lived out in physical spaces through social service, and it could be revealed in the "aesthetic and the numinous." The transition of the Word from "verbal proclamation to affective embodiment," (p. 97) was propelled by a Romantic impulse that emphasized experience and emotion rather than precise doctrinal meaning, and by Charles Briggs's theology, which gave intellectual legitimacy to a view of Scripture which emphasized imitating instead of idolizing the Bible. As Bowman put it, Briggs argued that the Bible "must be understood in terms of archetype and typology: it did not embody God, but it taught humanity the ways of living that would bring them into tune with the divine presence" (p. 99). Bowman suggests that a "self-conscious" liberal evangelicalism emerged in the time in between Brigg's 1890s trials and a speech made by Henry Sloane Coffin in 1915 in which Coffin claimed the label "liberal evangelical" as his own. In the time in between, social reform flourished, and liberal evangelicals began to understand their activism as a form of liturgy, a sacramentalism of sorts in which their presence in the city was meant to embody the Word. 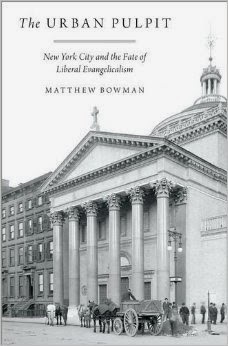 Redemption had come from hearing since the Reformation, Bowman wrote, but "it would now come by doing" for liberal evangelicals in New York (p. 112). It was on this last point, action as a liberal evangelical trait, that Bowman's New York-centric approach brought up some questions. He does briefly mention antebellum evangelical activists, but he does not discuss precursors like Washington Gladden, who in the 1870s was already advocating an "applied Christianity." By the 1880s, the notion of practical Christianity was so deep-seated in some Protestant circles that liberals (like Chicago divine David Swing) and conservatives alike congratulated revivalist Sam Jones for his efforts in emphasizing action over theology. Nor does Bowman give a nod to any of the radical figures of the postbellum holiness movement, people who left established denominations in the 1880s and 1890s to set up shop in the urban slums of American cities precisely because they believed the church was not practicing what it preached. How did those earlier notions of practical Christianity shape liberal evangelicals' emerging social activism in the 1890s? If they did not have much of an impact, what were the differences? Bowman's story is so deeply tied to New York that what was happening outside seems not to matter much, even if what was happening outside certainly must have influenced what was going on inside New York. Related to that point, Bowman does such an excellent job throughout the book of making room for nuance and complexity that I would have loved to see how groups that emerged from the holiness tradition fit in with his story. He gives Pentecostalism some space, but only briefly and only in its 1920s form. Part of this omission may stem from the evangelicals Bowman highlights: this book primarily includes Baptists and Presbyterians, with some Episcopalians thrown in. Methodists, who had more adherents in New York than Baptists and from whom many holiness movement denominations emerged in the 1890s, are no more than an afterthought -- perhaps because they did not have a dramatic fundamentalist-modernist split in the 1920s. 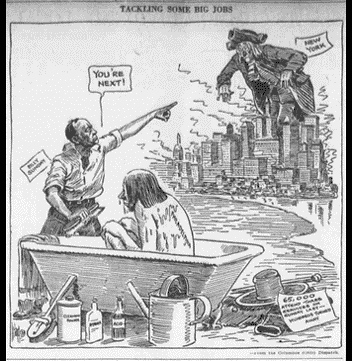 After explaining how a new liberal evangelical style developed in New York by 1915, Bowman turns to analyzing the tensions from left and right that rose in opposition. While liberal evangelicals like Charles Parkhurst responded to the diminished importance of the pulpit by trying to broaden the nature of their preaching, nascent fundamentalists took a different tactic. Continuing to "assert faith in the unaltered Word," they became more "strident and aggressive" in their verbal proclamations (p. 165). The increasingly vociferous assertion of the verbal Word became a feature of fundamentalism. The amped up aggressiveness revealed desperation caused by the diminished power of the Word in the city. But in fundamentalist preachers like Billy Sunday, the power of the Word was re-energized, and in John Roach Straton, the "first master" of fundamentalist provocation, it took on an even more sensationalized style. By the 1920s, liberal evangelicals and fundamentalists viewed each other as dangerous threats. While both sought spiritual power from God as the means of coping with an increasingly pluralistic city, their methods had become drastically different. Bowman argues that Harry Emerson Fosdick, for example, was not concerned so much with conservative doctrine, but rather with the fundamentalist style that was turning off young cosmopolitan New Yorkers to the gospel. On the other side, fundamentalists lamented Fosdick's imprecise doctrinal language and his focus on conduct as the defining characteristic of Christianity, which seemed to indicate to them a lack of regard for proclaiming the true unadulterated Word. By 1946, Fosdick and Coffin, "guardians of liberal evangelicalism" had retired. In the preceding decade, "the pressures of fundamentalism on one hand and progressivism on the other narrowed the ideological space for liberal evangelicalism to near nothing," (p. 15). And by the 1950s, Bowman notes, Billy Graham represented a conservative resurgence in claiming the evangelical label. Although Bowman does not mention this, some "mainline" Protestants -- in particular figures like Charles Clayton Morrison who were associated with the Christian Century -- tried to keep the evangelical label for themselves when Billy Graham rose to prominence. (Check out this Baylor ISR video lecture from Elesha Coffman on the subject). That they jockeyed for ownership of the label may indicate that liberal evangelicalism maintained vitality for longer than Bowman gave it credit for. At any rate, I was struck by how similar the debates between fundamentalists and liberal evangelicals in the early 1900s were to more recent battles within evangelicalism, especially between the emergent camp, the young/restless/reformed crowd, and (what now seems to be) more traditional conservative evangelicals. In both cases, doctrinal differences were highlighted, yet it seems that Bowman's emphasis on the differences in style and method is worth taking into consideration. As scholarship on liberal Protestantism moves forward, Bowman's work stands, in my mind, as absolutely essential to anyone interested in the field. His book is a reminder of the complexity within American Protestantism both then and now. Beautifully written with a compelling argument (although one that needs to be tested outside the confines of New York), Bowman manages not only to shine a light on some individuals who have been overlooked but also to bring a fresh lens of analysis to well-studied individuals (like Sunday) and topics (like fundamentalism v. modernism). It's early in the year, but I imagine this will be on my short list for favorite books of 2014. Great review of a great book, Paul! Wouldn't you know I just submitted my review of Urban Pulpit yesterday; I wish I would have had your thoughts while I was working on mine. In any case, I share your enthusiasm for Bowman's work. Thanks as well for the link to Elesha's wonderfully insightful talk on her book and varieties of evangelicalism in general. Thanks Mark! In what venue will your review be showing up? I'd love to see your thoughts on the book. This is very kind, Paul - thanks a great deal. I thought a lot about the tight focus on New York City, but ultimately felt that it allowed me to spend a lot of time developing particular stories (like the USR, or the opening of the Riverside Church), which would have of necessity been narrowed in a broader survey. It's a bit of a microhistory in that sense, but (as you indicate) I do hope it will be a jumping off point to explore larger trends. I'm also excited to see what Mark comes up with.